Florence Fuller was born in Port Elizabeth, South Africa in 1867 and migrated with her family to Melbourne during her childhood. By age 16, in 1883, she had enrolled to study painting and drawing at Melbourne's National Gallery School. She remained there for a year and returned in 1888. In 1885, Fuller spent a period as a pupil of her uncle, the noted portrait painter Robert Dowling, and received her first portrait commission that same year. She became, from this time, a portrait and landscape painter of note and would show her work regularly at various artists' society exhibitions in Melbourne. During the 1890s, Fuller furthered her studies at the Académie Julian in Paris and exhibited at the Paris Salon, Royal Academy and Royal Institute of Oil Painters in London. 'Weary' was first exhibited at the artist's studio around 1888, alongside the work 'Desolate', the latter of which is only known from press descriptions. Both works, portraying subjects of child poverty, immediately sold. 'Weary' depicts a homeless child with background imagery of Melbourne's docklands, providing a powerful statement on the disadvantaged within the context of the city's booming commerce. 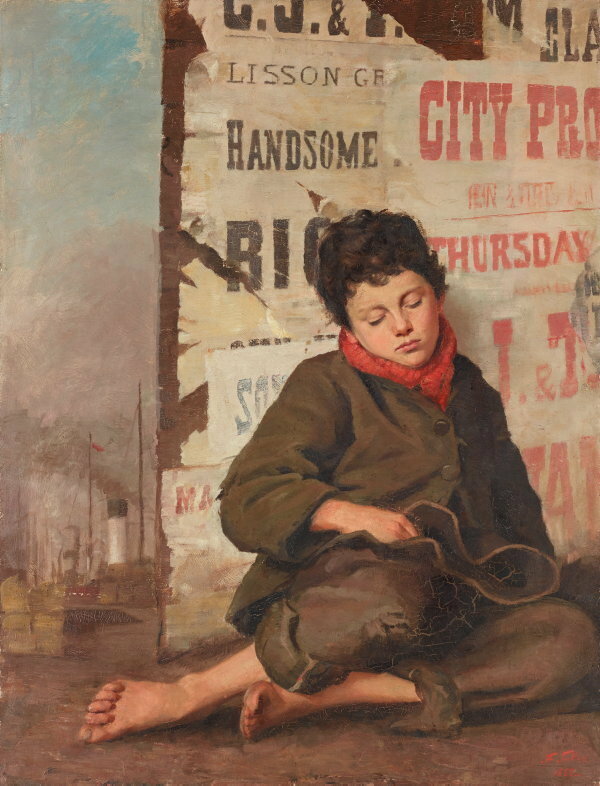 While subjects of the urban poor were popular in the art of Victorian England, 'Weary' is unusual in Australian art from this period for its stark portrayal of Melbourne's street life and for its politicised message of social injustice. The work is also unique amongst the extant works of Fuller's own practice. While the influence of Fuller's early painting instructor George Follingsby has been noted in relation to the narrative subject of 'Weary', the painting is more so telling of Fuller's distinct artistic vision in Melbourne art at this time. Striking is her inclusion of the tattered billboards, whose fragmented lettering renders their marketing messages alienating and incoherent. They imbue the painting with a sense of urban realism that is arguably unprecedented in Australian art. While the child may appear more cherub-like than destitute, Fuller draws on the figure of innocence to create a moving juxtaposition of the child against the dehumanising forces of the modern market place. Fuller found inspiration for this painting in the poem 'Weariness' by Henry Wadsworth Longfellow that ruminates on the impact of child labour. Fuller reproduced the opening lines of the poem: "O, little feet that such long years/ must wander on through hopes and fears"; on a plaque on the frame. The poeticised sentiments were significant in delivering the pathos of the work in its day. Signed and dated l.r. corner, red oil "F. Fuller./ 1888_".